The book is available via many channels such as Amazon, most bookstores, and SpringerLink. If your organization or university subscribes to the Springer Texts in Business and Economics series, you will even have free access. "This book is a perfect and modern combination of the basics and applications of Marketing Research. 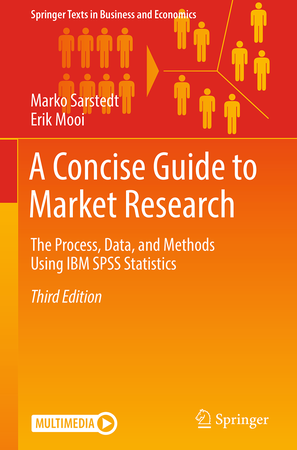 The relation between theory and how marketing research methods are executed in IBM SPSS Statistics is excellent. This book combines these elements with clear insights in problems and solutions that we often face in using marketing research techniques and methods. It is a must for every student and practitioner in Marketing and Marketing Research." "This book is my first choice when I introduce applied stats to students. The book covers everything you need (e.g., ANOVA, regression analysis, factor analysis, and cluster analysis), is easy to understand and has excellent market research examples, which my students really like." "This book really delivered to its promises! It is written in an easy to grasp style, while at the same time providing enough scientific background if you’re interested in the underlying concepts. I really like the SPSS examples and explanations how to read the outputs, as well as the rule-of-thumbs (as often you just don’t know what is “good enough” in terms of sample size, quality criteria, and effect size etc…)"
"Thanks to a clear and easy terminology with a strong integration of examples (including data samples) the Guide gives a smooth entry to the most important topics of empirical research and quantitative analytics using IBM SPSS. I can really recommend the book to anyone in charge to do empirical work. This holds for practical questions in daily industry business (market research, customer insights, RoM/RoI, KPI measurement) as well as research tasks in academia." "I found the book extremely helpful for my Master thesis in which I had to gather data and run the analysis without having been exposed to research methods before. Its contents are easy to comprehend and offer step-by-step guidance on how to run simple and more advanced analyses."